This expressive French violin gives us an authentic look at the work of the influential luthier Justin Derazey when he was at the zenith of his artisanal and entrepreneurial development. The son and student of a long-time Vuillaume employee, the award-winning Jean-Joseph Honoré Derazey, Justin had taken over his father's workshop in 1879, one year before this violin was crafted. In doing so, he also took on the legacy of the famous workshop of Joseph Nicolas fils, which not only provided him an endless supply of excellent aged tone woods from Transylvania and higher altitudes in Switzerland; it also offered him a well-established brand. 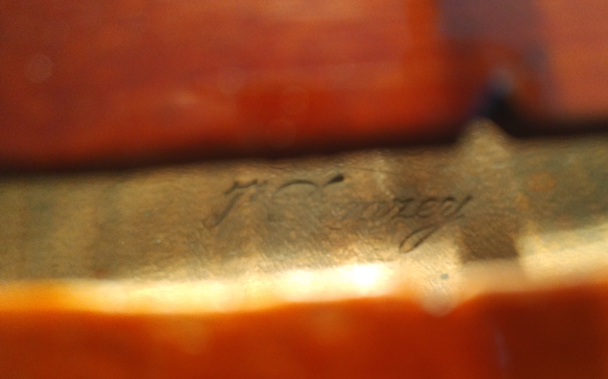 He sold his employees' instruments under the Nicolas name, whereas authentic Justin Derazey violins such as this one bear his own brand mark exclusively. Here Justin Derazey followed a broad Stradivari model whilst also exhibiting his own highly evolved and sophisticated craftsmanship: the finely to moderately grained spruce of the top and the tight flames of the maple used for the two-piece back were used to create a body with well-balanced resonant properties. The scroll is an elegant carving that features an eloquent and very distinctive style which Derazey further accentuated by blackening the edges. The luminous golden-brown varnish shows traces of a long musical history and intense playing; over the years it has developed a magnificent patina that shapes the antique aesthetic of this attractive violin, a piece in outstanding condition with no cracks or repairs. At our workshop we have thoroughly set it up and made it ready to play so that this Justin Derazy violin can reach the fullest extent of its powerful, mature sound – a clear and nuanced voice that sings in the finest French violin-making tradition.